In my previous post, I talked about how my family has ended our relationship with cable and gone strictly to watching our television programs online. One of the benefits I listed was the limited number of commercials my kids now view. People are starting to realize that a 60 minute show only has about 40 minutes of actual content. One-third of their TV viewing time is spent watching commercials. Thanks to companies like Netflix, we’ve experienced how great television viewing can be without commercial interruption. 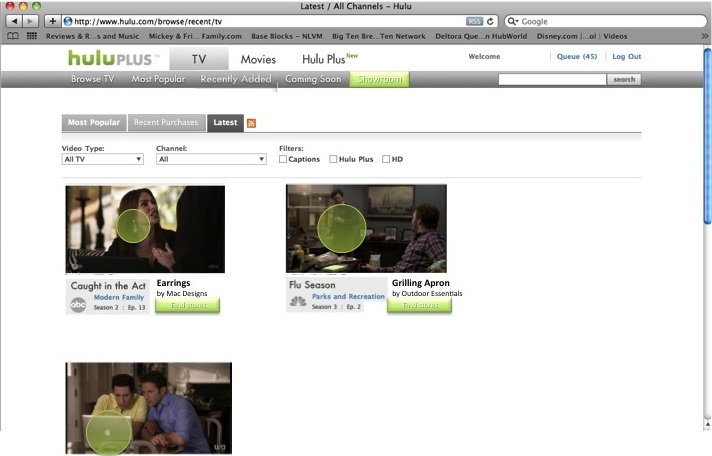 Hulu Plus is a paid subscription service that streams content with limited commercials. Those limited commercials are also my biggest complaint with the service. If I’m paying a monthly fee just like I do with Netflix, why am I still seeing advertisements? I believe consumers will demand a change in how content is delivered and one of those changes is to eliminate commercials as we know them. The role of product placement in television shows and movies will be forced to increase. How consumers are invited to learn more about those products will be the important factor. There is a trend I’ve seen in the last couple of years where the writers of a show are being asked to incorporate product features into the script. To me, this is dangerous ground. As a writer, how do I balance the integrity of my work with a ‘Marketing suit’ coming to my desk telling me I have to add a commercial into the show or lose my job? Not to mention how the actors and actresses feel about doing a product pitch while keeping with their characters. They will reach a breaking point. Magazines like Entertainment Weekly have features where readers ask how they can get products that appear in movies and TV. For example, “Where can I get the necklace that Bella wore in The Twilight Saga: Eclipse?” The magazine responds with the name and price of the actual product as well as similar items. What if that type of question & answer was instantaneous? What would happen if shopping content was embedded into streaming online video like an easter egg on a DVD? I propose that advertising in the future be a seamless experience where I can enjoy the content of a show without being bombarded by ads every few minutes. Let’s say I’m watching ABC’s Modern Family on Hulu. As I’m watching the show, I see a pair of earrings that I think my wife may like so I click on them. The video stream isn’t interrupted and I continue to enjoy my show. However, my earring selection has been added to a new “showroom” section of the website. When I finish watching my show, I can head to the “showroom” where I can see a screenshot of the items I have clicked. Information about the item includes the show and episode I was watching, a highlight of the product selected, the manufacturer, and a link to find stores where the product is sold. The “showroom” could also contain the most popular items being viewed as well as my own purchase history. We’re able to engage the customer without interrupting the content that is driving the consumer to the site. Costs associated with this type of advertising is also reasonable. The product company pays for the product shown in the program as well as a standard fee to make the item clickable during video streaming. The content provider can then use a standard pay-per-click (PPC) model to determine additional advertising costs. It’s time for marketing and advertising departments to realize that the world is changing. The traditional way to send your message to consumers and sell your product may not be the most effective way in the years to come. I like it. I think I’d use it. The name “showroom” is GREAT.